These illusion images and pictures will blow up your minds and it will make you believe that everything that you perceive is not always correct. Do you know that your eyes and brain doesn't always make correct decisions. but these incorrect decisions made and perceived by our brain and eyes makes some amazing perceptions. In this post I will show 5 examples of some very cool and amazing illusions that will confuse your mind. You may like to see some HD Wallpapers. So! Are you in the mood to play with the capabilities of your brain and eyes? These illusion images and pictures will blow up your mind and it will make you believe that everything that perceive is not always correct. Let's get started. Take a look at the image given below. Now, did you notice any changes in the picture? If you didn't notice any changes than look at the image again. This time, stare at the plus (+) sign at center. If you will stare for little long than you will notice that the color of the rotating circles or dots changed and each and every dots around plus (+) sign disappears and they start turning into green color. Now take a look at the another illusion picture show below. See the example of another optical illusion below and say what changes you notice or if their isn't any trick? Wait for the loading to finish. if you haven't seen the dot at the middle of the image than you will not notice any color changes in the picture. To see changes, see the image again from starting and see the dot at the center this time and wait for the loading to finish. You will see that the black and white building gets converted into colored building when you see at the center of the image. Not over yet? See the following optical illusion pictures and notice the changes and each one (if you can). See the picture of the four perfectly rounded circles. Confused? Stare closely. 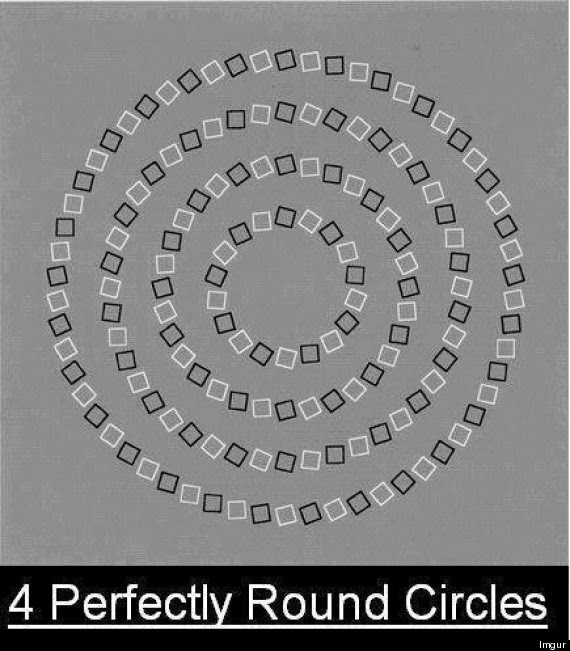 Did you see four circles? Circles is moving or not? See the picture of an amazing optical illusion picture shown below. If you can't notice the illusion than right click on the image and that click open image in new tab to see the picture in larger size. Is it Yes? or it is No? These were 5 amazing illusion picture which should have played with your mind.